A brand new giveaway! Today we celebrate the release of the final installment of The Hobbit on blu-ray and DVD! 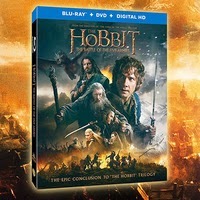 We love this movie and it is a MUST to add to The Hobbit collection! You can win your own be entering below! YOU ARE BRAVE LIKE BILBO! I am not brave like Bilbo apparently when danger lurks by I will run in the other direction. This sounds like me. I'm not brave like Bilbo. This is what I got on the quiz; YOU ARE BRAVE LIKE BILBO! Yes, I'm brave as bilbo. Great giveaway, thought the third movie finished this trilogy well. No I am not as brave as bilbo I am cautious. I got you are brave like Bilbo!